Eduardo Schuldt attempts to put Peruvian horror on the map with his 2015 supernatural horror film: The Entity. We all know that the found-footage film genre has been done to death, especially with the Paranormal Activity franchise milking as much as possible from it. However there are those which stand out from the rest and actually accomplish their goal of giving its audience a shiver down their spine; V/H/S 2 and Grave Encounters to name a few. The Entity falls somewhere in the middle of that spectrum, with the effects and atmosphere offering so much, but let down by the plot’s attempts to throw in some twists and turns. It all begins with the shaky camera footage of an unfortunate victim of the film’s antagonist, running and screaming around a cemetery in the dark, while off-screen-ghouls and crying angel statues torment him. The audience is told that this video has since gone viral on the internet. 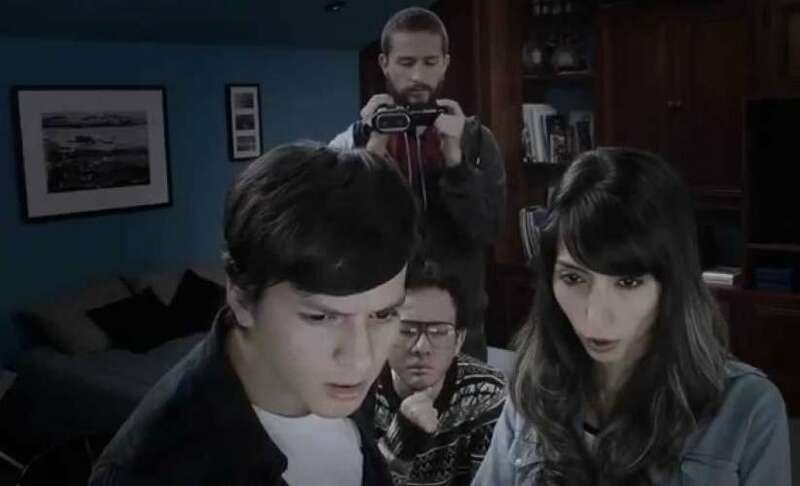 The film then jumps to a group of college film students, Joshua, Lucas and Benjamin, who are trying to think of an idea for their film project. Luckily Joshua’s ex-girlfriend, Carla, appears and gives them the idea of doing their project around reaction videos, in which you film people’s reactions to horrific videos, such as torture. After they watch a video of people viewing one of these horrific films, the decision is made to track down one of the individuals in the film, whom Carla claims knows. To their horror, every person who has seen the original video is now dead, however one of their family member’s explains the story and takes them to a large cemetery, where they find the film and watch it for themselves. Something they soon regret, as they have become cursed by a demonic entity that will stop at nothing until they are all dead. The opening of The Entity is very promising, although the camera work can get on your nerves, the antagonist that can constantly be seen just slightly off-screen shrouds the film in mystery and gives it a really creepy vibe. The film starts going downhill from there though, with questionable acting, cliché horror film characters and plots twists which leave gaping holes in the rest of the story. The film also raises that question which all hand-held movies need to answer at some point; why are you still filming? It could be argued that they want to capture everything on tape because it is for their film project, but they are not a news or documentary crew who are going to break a huge story, just some students who could run much faster if their cameras were not slowing them down. As was said earlier, plot twists are added that need a better explanation, up until that point in the film the other faults could be overlooked, as the official story of the demonic entity is rather chilling and the effects are not second-rate. Unfortunately it ended far weaker than it started. A for effort and effects, but a solid film needs to have a solid story to keep things afloat. The Entity screened as part of Film4 FrightFest 2015 and will be available on DVD and Digital from 12 October 2015.